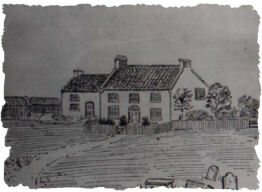 Middlesbrough was still only a farm of 25 people as late as 1801; the town did not start to grow until 1829 when a group of Quaker businessmen, headed by Joseph Pease of Darlington, purchased the farm and developed the 'Port of Darlington'. A town was planned on the site of the farm to supply labour to the new port. Pease was the son of Edward Pease, who had developed the Stockton & Darlington railway, and when this line was extended by 6 km/4 mi in 1830 to Middlesbrough, the town and port expanded rapidly. In 1850 iron was discovered nearby, and it gradually replaced the transportation of coal as the chief industry & by the end of the century the town was producing 33% of the nation's total iron output. By 1901 the population had grown to 90,000. When the heavy industry sector started to decline in the 20th century Middlesbrough diversified into light industry.